This fund was set up in memory of Sarah Greene, who died of Triple-Negative Breast Cancer in 2006. Sarah’s extended friends and family have already raised over £1.25 million which has paid for two long term research fellowships based at the The Breakthrough Research Unit , King’s College University, London . We are now working hard to raise further money to add more scientists to support this team. Every pound raised goes towards this new Fellowship and will help us find new and better treatments for Triple- negative Breast Cancer to save lives. Dr Sheeba Irshad is the second Sarah Greene Clinical Research Fellow. Since 2010 she has been working with Professor Tony Ng’s group to investigate the role our immune cells play in helping breast cancer cells spread to other parts of the body. Her findings will allow the development of therapies that block these processes and ultimately save lives. Her work continues to form an important part of our overall research plan at KCL. 11,000 women are diagnosed with triple negative breast cancer every year. There are still no targeted treatments approved for triple negative disease, which affects 15% of women with breast cancer. Understanding the causes of, and developing better treatments for, triple negative breast cancer is vital if more women are to survive the disease. With our help,the Research Unit at King’s College London is focusing on triple negative breast cancer. With your help, their scientists are working to ensure women need no longer fear a diagnosis of this aggressive type of breast cancer. • Identified four new genes that may drive TNBC and further 164 genes that will now be investigated further. The team is currently investigating the potential for treatments that block these genes. • Shown that 20% of women with TNBC carry a mutation in the BRCA1 gene that can be inherited, meaning close female relatives may also be at higher risk of developing breast cancer. • Found 7 new molecular markers that predict patients at high-risk of developing secondary breast cancer. • Created a practice-changing study called the Triple Negative Trial, which is aiming to work out which of two chemotherapy drugs work best for women with triple negative breast cancer, and are working to develop new drugs for these patients. Update: The King’s College London Research unit underwent a very successful scientific review in February 2018, and a forthcoming report will show the incredible impact of all the fundraising the SGTF has done and continues to do. Breast Cancer Now thanks the Sarah Greene Tribute Fund for their generous support of Prof Tony Ng’s and Prof Andrew Tutt’s work, at the Breast Cancer Now Research Unit at King’s College London. Professor Ng and his team will develop antibodies that specifically recognise TNBC cells, with the ultimate aim that they will be used to diagnose and treat TNBC. Professor Ng is a specialist in Immunology and cancer biology. His experience in generating antibodies for skin cancer means we expect his lab to successfully generate antibodies against TNBC cells. The immune system can sometimes aid the development and spread of breast cancer. Professor Ng identified a type of white blood cell from the immune system which is found in TNBC and not in other types of breast cancer. He believes these white blood cells encourage the cancer to metastasise (grow and spread to other parts of the body). Professor Ng will investigate this further, increasing our understanding of TNBC and identifying new avenues of treatment. Ultimately, these findings will form the basis for new treatments that prevent secondary breast cancer and save thousands of lives a year. Thanks to funding from the Sarah Greene Tribute Fund, we are able to fund world class physicians and scientists like Professor Andy Tutt, Dr Elodie Noel and Dr Sheeba Irshad. Their research is key to improving treatments for women with Triple Negative Breast Cancer. Dr Sheeba Irshad has been appointed Clinical Deputy Head of King’s College London Research Unit Programme, and has also received funding for her new research programme from CR-UK as a Clinician Scientist Fellow. 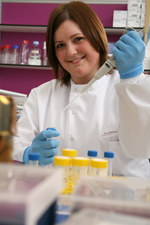 She secured the CRUK clinician scientist fellowship to help fund work to take forward some of the findings from her PhD work as a Sarah Greene Clinical Fellow. The work she will be carrying out will investigate what factors influence the immune cells to enter the triple negative breast cancers and how we can exploit these mechanisms therapeutically. Dr Irshad’s recent collaboration with Professor Tony Ng, to use specialist imaging techniques to study the role of the immune microenvironment in tumour growth. Publication: Cancer Res. 2017 Mar 1;77(5):1083-1096. doi: 10.1158/0008-5472.CAN-16-0598. Epub 2017 Jan 12. For information on Professor Tony Ng’s work ‘watching the immune system help breast cancer spread’ here. Research projects related to triple negative breast cancer can be read about here.